When our family moved to Shakopee four years ago, we looked at a few cities in between our respective jobs. I felt it was important to choose a city where a home would be a good financial investment but also a community that would help shape our family’s future. We were impressed by the changes Shakopee was making, luring or expanding large companies while maintaining a unique city landscape featuring local businesses. Meeting Brad Tabke, Shakopee mayor from 2012-2016, I recognized the thoughtful approach Shakopee took to growth reflected his own leadership style. In Brad, I found a curious, considerate, and tenacious individual who truly loves his city and seeks to serve it however he can. Brad is a leader who works to understand the details of a problem because he knows those details ripple into our neighborhoods and into our homes. Solutions for complicated issues may not be clean sound bites, but are far more valuable than boastful empty rhetoric. It’s also evident that Brad cares deeply about Shakopee and its townships. I can think of more than one occasion when I’ve mentioned a planned purchase and he implored me to give a local business a chance before considering buying online. 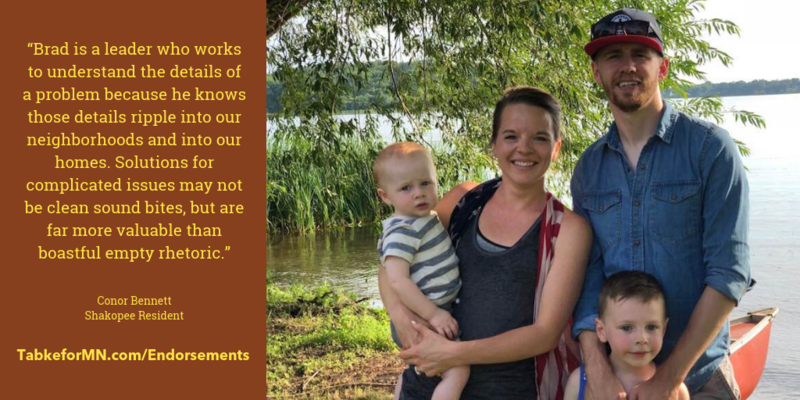 Shakopee deserves a representative who concerns themselves with understanding every facet of an issue, sweating the smallest of details, and one who cares deeply about our community. I believe that person is Brad Tabke. I hope you’ll join me in voting Tabke for Minnesota House on Nov. 6.